We are pleased to present our newsletter...called "The Telegram." 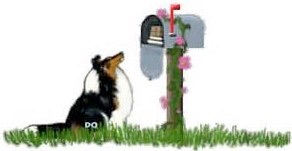 This Sheltie Newsletter is being sent out FREE to those Sheltie fanciers who want more up-to-date news about Shelties and their activities. We are also posting it here on our website for those who prefer to read our newsletters while on-line. You are invited to e-mail us timely and informative articles that you think should be shared among other folks who own dogs and cats. We accept Specialty show dates and contact information, along with announcements of upcoming events, warnings and seasonal news. If you know of someone else who would like to receive these emailed notices and articles, please send his or her e-mail address to s.pacesetter@sheltie.com. Below are each of our free dog (& cat) newsletters. Enjoy!